Soon-to-be kidney donor Rob McCollough, right, gave his soon-to-be recipient Chelcy, a special mold to share good the good news that his wait for a kidney transplant would be over soon. No. I learned he needed a kidney through a random post that popped up on my Facebook page. He actually lives only 15 minutes from me. I felt I received a message from God telling me I needed to step up and help him. No, because of my belief in God. Being able to financially provide for my family while off work recovering. Disbelief mostly, they couldn't understand why I would donate, especially to a stranger. Questions they usually asked were, “What if one of your children needed a kidney?” I replied, “I do not believe that I am the only person willing to step up and help others.” When they asked why I would help a stranger, I replied, "Why wouldn't I?" Rob getting ready to hit the streets of Cincinnati to walk the Heart Mini 5K event five days after his kidney donation surgery. The original surgery date was January 23. During pre-admission testing, we learned that my white cell count was elevated. Once cleared, surgery was rescheduled for February 6, only to be postponed the very next day because Chelcy had the flu. After getting cleared, surgery was rescheduled for March 13. The surgery itself went well. It took an extended amount of time to get out of recovery and up to my room (due to no rooms being ready). A couple of hours after being in my room, I needed to get up and just move—I wanted to walk to my door and back to bed. Once at the door, I decided I needed to keep going so I proceeded to walk down the hall. A nurse saw me and said, “You are amazing, I have never seen anyone walk the hall this short after surgery.” I did make a full lap around the floor; it felt really good to walk. Recovery was good; food was very good. I would try to walk the floor every time I would wake from a nap regardless of the time of day. It went well. I felt good enough to walk the Heart Mini 5K event five days after my surgery. The Saturday before Easter (2 ½ weeks after surgery) was my worst day so far. I had a sharp pain in my side a good part of the day. I believe it was healing pains because Sunday the pain was gone. I returned to work April 26, 2018. I was off six weeks. How long was the process from making the first contact about donating until your surgery? About nine months. Once it was determined I was a match, there was a concern because my heart rate was elevated. They recommended I lose weight (15 pounds) and return for a 24-hour heart monitor test. I went on a low-carb diet (50-150 carbs per day). I lost 13 pounds the first week, and continued the low-carb diet and averaged about a 2-pound loss per week following. After two separate 24-hour heart monitor tests I was finally approved to donate. This was about two weeks before Christmas. 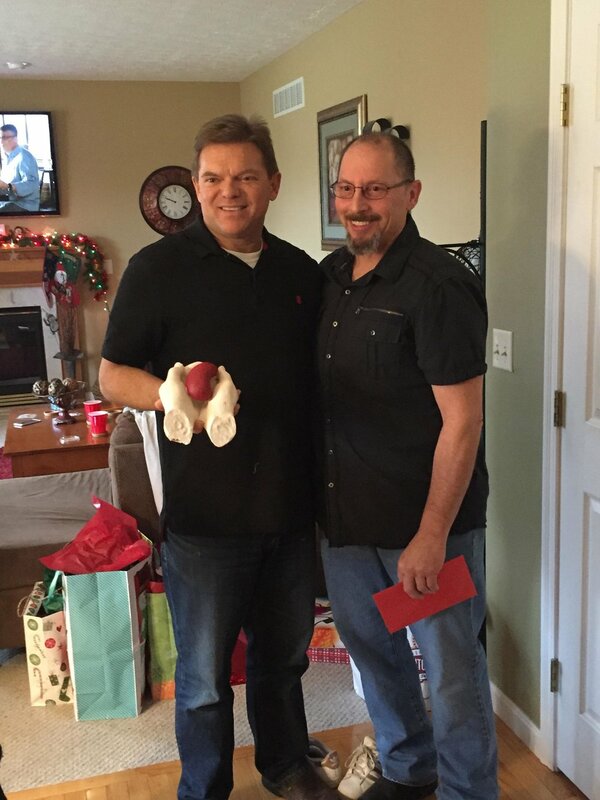 I made a mold of two hands holding a kidney and gave it to Chelcy at his family Christmas party to reveal that our surgery was a go. The show of support from both families involved.